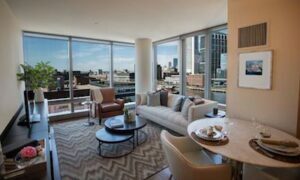 Looking for a Boston luxury apartment building that meets all of your criteria can be challenging, but not because you can’t find what you want. There are so many excellent apartment options in the Boston area that it can be hard to choose! 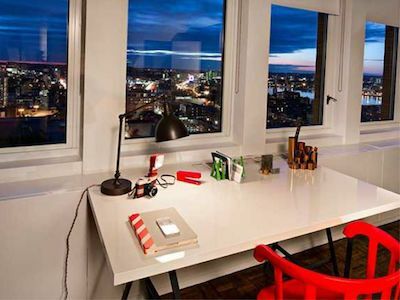 If breathtaking views are at the top of your list, check out these 5 apartments. Ava Back Bay is a unique and modern apartment complex that is new to the Back Bay area. 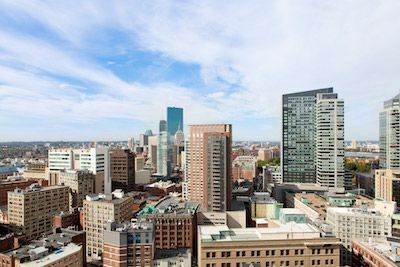 Close to shopping, restaurants, and the performing arts, AVA Back Bay is the perfect apartment building for the person who loves to soak in the sights and sounds of the city. One, two, and three-bedroom apartments are available, and features social spaces and common rooms to help you connect with like-minded neighbors. 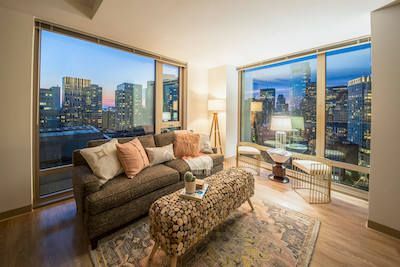 Of course, one of its best amenities is the view — whether your apartment overlooks the water or the city, you can’t go wrong. Overlooking the Boston Harbor, the Benjamin Seaport Residences are hard to top. Positioned to allow residents both views of the water and the Downtown Boston skyline, this complex gives you the best of both worlds. 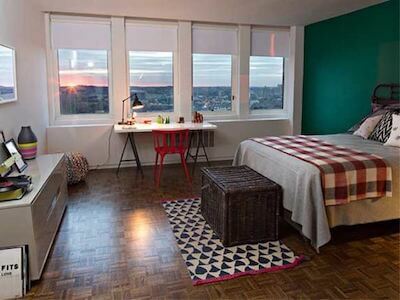 Naturally, floor-to-ceiling windows make the most of this incredible view. Amenities include a pool, deck, terrace, and multiple lounges all expertly designed to offer the utmost in luxury and comfort. Those seeking the best of the best will want to look at the Penthouse Residences with private-access elevators to the Penthouse floor. 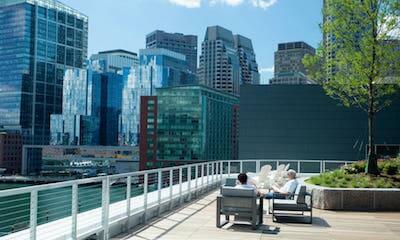 Near Chinatown, One Greenway offers unparalleled views of the city on more than just the top floor. 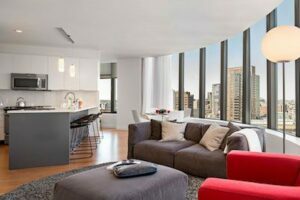 Windows in multiple rooms let you enjoy the view from every angle imaginable, and if you’re a city lover, you’ll feel right at home here. The building offers its residents a wealth of amenities as well, including a fitness room and classes, suites for entertaining friends, a stunning outdoor terrace with fire pits, a 24-hour concierge, and a dog grooming area. While great views can be found all over the complex, One Greenway’s Penthouse suites are simply perfect. 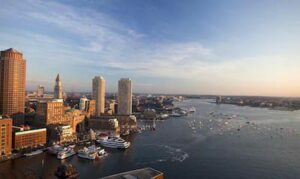 In the heart of Boston sits the Pierce Boston the quintessential luxury apartment with views that will take your breath away. From the 30th floor, see the Charles River, Harvard University, Fenway Park, and the Boston Common to name a few. One, two, and three bedroom apartments are available, along with just ten select Penthouses, many with a private balcony to fully soak in the picturesque Boston skyline. 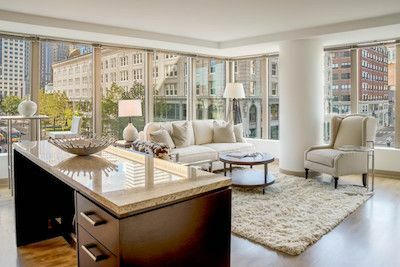 Amenities include everything you can think of, including a fitness center with a yoga studio, multiple common areas with Wi-Fi access, a sky top pool with a hot tub, a library, a private dining room, garage parking and in-house car detailing, and more. 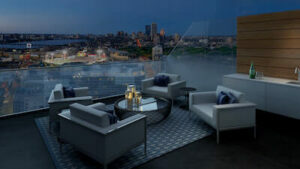 This curved luxury apartment complex located on Kingston street offers a unique touch to commanding views of downtown Boston. The open-plan living area, kitchen, and dining area are positioned to have an optimal view of Boston through the curved window wall. If you’re looking for unique and truly stunning, Radian has it all. 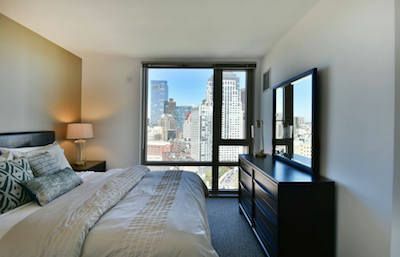 Amenities include access-controlled garage parking, a dining and meeting lounge, a fully furnished guest suite for visitors, pet care, dry cleaning, and more. Overlook the Greenway in the lap of luxury at Radian. 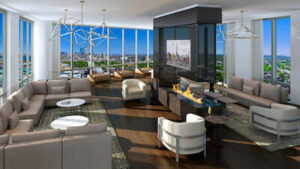 Looking for Boston luxury apartments with an unmatched view and amenities to make life easier and more enjoyable? Use our apartment search feature to find exactly what you’re looking for. 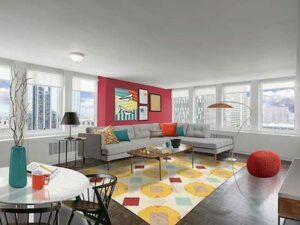 We can guide you to the perfect apartment that seems like it was designed just for you.